South Africa’s Minister of State Security David Mahlobo is at the centre of a media firestorm over his alleged ties to a rhino horn trafficker who has openly bragged about bribing justice and immigration officials. The claims in a new documentary come as President Jacob Zuma’s increasingly embattled administration lurches from one political scandal to another. 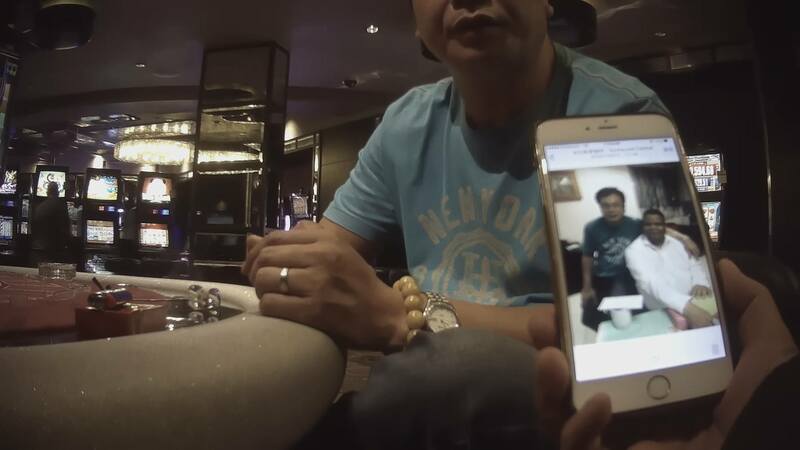 Secretly filmed by an undercover investigator working for Al Jazeera Investigates – the Doha-based television news channel’s flagship investigative programme – the Chinese trafficker, Guan Jiang Guang, boasted that he knew Mahlobo “well” and that the minister had been “a guest at my home”. Guan – who showed the investigator what appeared to be several photographs of himself and the minister together (see above) – also made the startling claim that while Mahlobo “doesn’t do any business”, his wife “is out front…whenever there is a big project”. “It’s very common in South Africa that the wives are doing business and the husbands are acting officially,” Guan alleged. Guan offered to help the investigator – who he believed to be a prospective business partner – to obtain rhino horn. The investigator later met a contact of Guan’s in China’s Fujian province and was offered a 2.25kg rhino horn at $27,000 a kilogram. Mahlobo has admitted meeting Guan and visiting the trafficker’s nail salon and massage parlour in the city of Mbombela in Mpumalanga province, but he has vehemently denied Guan’s claims about himself and his wife, describing them as “reckless and mischievous”. “[Al Jazeera] are basically linking the fact that I used to visit a spa…solely for the services that they render, to the illegal poaching of rhino horns by its owner.” He said neither he, nor his family, had any business relationship or friendship with Guan. Mahlobo has threatened to sue Al Jazeera and publications that reported on the documentary. The allegations are significant given the mandate of the State Security Agency, which he oversees, to gather and assess critical intelligence on national security threats, including organised crime. Zuma has described wildlife trafficking as a “significant threat…to [South Africa’s] national security”. No hard evidence has emerged to date linking Mahlobo directly to rhino horn trafficking, or any other illegal activity involving Guan. And there have been documented cases in South Africa of fraudsters and gangsters using photographs taken with politicians, police officials and celebrities to create a perception of influence in order to “knock” or con targets. But, given that Guan is a self-confessed criminal, and that his comments about Mahlobo – a senior cabinet minister – were offered up unsolicited in a discussion with someone he believed to be a potential partner in a criminal enterprise, they should be taken seriously and rigorously investigated. Mahlobo this week asked the Mpumalanga police commissioner to “immediately investigate all allegations” levelled against him and to investigate Guan’s involvement in rhino horn trafficking and bribery. But to have credibility such an investigation would need to be seen to be independent and transparent. Mahlobo is an influential figure in Mpumalanga. He grew up there, played a leading role in African National Congress structures in the province and, prior to his appointment to the State Security portfolio, headed up the department of cooperative governance and traditional affairs there. According to a report in South Africa’s Business Day newspaper today, the investigation has now been referred to the national Directorate for Priority Crime Investigations, better known as the Hawks. But they have been mired in their own scandals. Their head, Lieutenant-General Mthandazo Ntlemeza, once described as “biased and dishonest” by a High Court judge has been accused of being used as a pawn by factions loyal to Zuma. There have been calls for an independent commission of inquiry be established to investigate the Mahlobo matter. With the Hawks on the case, that appears unlikely to happen. Some have suggested the new Public Protector, Advocate Busisiwe Mkhwebane, be asked to investigate. But she is a former State Security Agency employee and her brief tenure has not been without controversy. The Inspector-General of Intelligence would be another possibility, but the post has been vacant for more than a year-and-a-half and the inspectorate has been described as “barely functional”. The allegations against Mahlobo are the latest in a steady stream of scandals enveloping Zuma, members of his family and cabinet, and high-level officials in the African National Congress and parastatal organisations. There are persistent allegations that government ministers and institutions have been systematically “captured” by powerful political and business interests aligned to Zuma. Corruption in South Africa is widespread. A 2014/15 Victims of Crime Survey found that 48% of households believe that police are corrupt, co-operate with criminals (39.1% of respondents) or are simply “lazy” (58,6%). Violent crime is on the rise and key security structures vital to combating organised crime have been crippled by years of maladministration, political meddling and abuse. Several scandals over the last decade have centred on high-level law enforcement officials. Key among them was Jackie Selebi, the disgraced national police commissioner and Interpol president, who admitted to a friendship with a drug smuggler and was subsequently convicted of corruption and briefly jailed. Suffering from renal failure, he was released on medical parole and died at home at the age of 64. His successor, Bheki Cele, also became embroiled in a corruption scandal and was dismissed from the police after being found unfit for office. And in 2010, Sheryl Cwele, the wife of Mahlobo’s predecessor as State Security minister, Siyabonga Cwele, was arrested on international drug trafficking charges. She was later convicted and imprisoned. Her husband said he had no knowledge of her criminal activities and the couple divorced in 2011. In addition to the allegations about Mahlobo, the Al Jazeera documentary suggests that delegates accompanying President Xi Xinping to South Africa last year for the Johannesburg summit of the Forum on China-Africa Co-operation (Focac) bought rhino horn and “a lot of” ivory. Rather than calling for an investigation, Mahlobo has expressed concern that the claims could damage international relations between South Africa and China. “Why would you say the president of China brings a powerful delegation on an important African mission and say they’ve committed criminal activities?” he asked in an interview. There are no indications at this stage that the allegations of ivory trafficking will be investigated. The Global Initiative Against Transnational Organised Crime worked closely with Al Jazeera on aspects of the documentary focusing on allegations of high level involvement by Vietnamese and North Korean diplomats in the illicit rhino horn trade. Drawing on reports published by GITOC in July, the filmmakers investigated links between the Vietnamese embassy in Pretoria and a game farm in South Africa’s North West province that is owned by a Vietnamese businessman and alleged rhino horn kingpin. A number of rhinos have been killed by poachers on the farm in mysterious circumstances in recent months. The farm has also been home to significant numbers of tigers. Some have been hunted and there are unconfirmed claims that tigers on the farm have been killed for their bones and body parts. by Julian Rademeyer, Global Initiative Senior Research Fellow. El Ministro de Seguridad Nacional de Sudáfrica, David Mahlobo, se encuentra en el centro de una tormenta mediática por supuestos lazos con un traficante de cuernos de rinoceronte que presume abiertamente de sobornar a la justicia y a oficiales de inmigración. Las afirmaciones en un nuevo documental surgen en un momento en el que la administración del presidente Jacob Zuma tambalea entre un escándalo político y otro. Durante una cámara oculta realizada por un investigador de Al Jazeera Investigates – el principal programa de investigación del canal de noticias de Doha -, Guan Jiang Guang, un traficante de origen chino, alardea de que conoce “bien” a Mahlobo, y de que el ministro ha sido “un invitado en mi casa”. Guan, que durante la conversación mostró lo que parecen ser varias fotografías de él y el ministro juntos (ver arriba), también afirmó que si bien Mahlobo “no hace ningún negocio”, su esposa “es la que está al frente… cada vez que se presenta un proyecto importante”. “Es muy común en Sudáfrica que las esposas sean las que se encargan de los negocios cuando los esposos trabajan en el gobierno,” comenta Guan. Guan le ofreció su ayuda al investigador – quién se hizo pasar por un posible socio comercial – para conseguir cuernos de rinoceronte. El investigador luego se reunió con un contacto de Guan en la provincia de Fujian en China, quien le ofreció un cuerno de 2,25 kg a $27.000 el kilo. Mahlobo admitió haber conocido a Guan en una visita al salón de belleza del traficante en la ciudad de Mbombela en la provincia de Mpumalanga, pero niega vehementemente las afirmaciones de Guan sobre él y su esposa, a las que describe como “descabelladas y malvadas”. ”[Al Jazeera] está relacionando el hecho de que yo solía visitar un spa… sólo por los servicios que ofrecen, con la caza furtiva de rinocerontes que lleva adelante su dueño.” Sostuvo que ni él ni su familia tenían ningún tipo de relación comercial o amistad con Guan. Mahlobo amenazó con demandar a Al Jazeera y a las publicaciones que informen sobre el documental. Las alegaciones son importantes dado que la tarea de la Agencia de Seguridad Nacional, la cual está bajo su supervisión, es recopilar y evaluar material crítico de inteligencia que impliquen amenazas a la seguridad nacional, incluyendo la delincuencia organizada. Zuma ha descrito al tráfico de vida silvestre como “una amenaza significativa…. a la seguridad nacional [de Sudáfrica}”. A la fecha, no ha surgido prueba contundente que conecte directamente a Mahlobo con el tráfico de cuernos de rinoceronte o con cualquier otra actividad ilegal que involucre a Guan. Lo que sí existen en Sudáfrica son casos documentados de estafadores y gangsters que utilizan fotografías tomadas con políticos, oficiales de la policía y celebridades para crear una percepción de influencia y engañar a quien sea en ese momento su objetivo. Sin embargo, dado que Guan es un delincuente auto-confeso y que sus comentarios sobre Mahlobo – un ministro de gabinete de alto nivel – se dieron en una conversación con alguien a quien él creía un potencial socio comercial, deberían tomarse seriamente y ser investigados de manera rigurosa. Esta semana, Mahlobo le solicitó a la policía de Mpumalanga “investigar inmediatamente todos los dichos” en su contra e investigar la participación de Guan en el contrabando de cuernos de rinocerontes y sobornos. Pero para que la investigación goce de credibilidad, debería ser vista como independiente y transparente. Mahlobo es una figura de influencia en Mpumalanga. Creció allí, tuvo un rol importante en las estructuras del Congreso Nacional Africano en la provincia y, antes de su nombramiento en la cartera de Seguridad Nacional, lideró allí el departamento de gobernación cooperativa y asuntos tradicionales. a quien una vez un juez de la Suprema Corte describió como “parcial y deshonesto”, ha sido acusado de ser utilizado como peón por facciones leales a Zuma. Se han hecho llamamientos para que se establezca una comisión de investigación independiente que estudie el caso de Mahlobo pero, con los Hawks en la causa, parece poco probable que eso suceda. Algunos han sugerido que sea la nueva Protectora Pública, la Abogada Busisiwe Mkhwebane, quien lleve adelante la investigación, pero su breve paso como empleada de la Agencia de Seguridad Nacional no estuvo libre de controversias. El Inspector General de Inteligencia sería otra posibilidad, pero el puesto ha estado vacante por más de un año y medio y el cuerpo de inspectores ha sido calificado como “poco funcional”. Las alegaciones contra Mahlobo son las últimas en una serie de escándalos que rodean a Zuma, a miembros de su familia y gabinete, y a funcionarios de primera línea en el Congreso Nacional Africano y organizaciones paraestatales. Existen alegaciones persistentes que ministros del gobierno e instituciones han sido “capturados” sistemáticamente por intereses comerciales y políticos poderosos alineados a Zuma. La corrupción en Sudáfrica es generalizada. Un sondeo de 2014/15 de Víctimas de la Delincuencia reveló que el 48% de los hogares cree que la policía es corrupta, que coopera con los criminales (39,1% de los encuestados), o que simplemente son “haraganes” (58,6%). Los delitos violentos vienen en alza y las estructuras más importantes para la seguridad, vitales para combatir la delincuencia organizada, han sido castigadas por años de mala administración, intromisión y abusos políticos. Varios escándalos sucedidos durante la última década han recaído sobre funcionarios de seguridad de primera línea, entre ellos Jackie Selebi, Comisario de Policía y presidente de Interpol, quien admitió una amistad con un narcotraficante y fue seguidamente condenado por corrupción y brevemente encarcelado. Fue liberado bajo libertad condicional por una deficiencia renal y falleció en su hogar a la edad de 64 años. Su sucesor, Bheki Cele, también se vio en medio de un escándalo de corrupción y fue desvinculado de la policía luego de ser considerado no apto para la función. Y en 2010, Sheryl Cwele, la esposa del predecesor de Mahlobo en el Ministerio de Seguridad Nacional, Siyabonga Cwele, fue arrestada por una causa relacionada con el narcotráfico. Fue más tarde condenada y enviada a prisión. Su esposo dijo que no tenía conocimiento de las actividades delictivas de su esposa y la pareja se divorció en 2011. Además de los dichos sobre Mahlobo, el documental de Al Jazeera sugiere que hubo delegados que acompañaron al Presidente Xi Xinping a Sudáfrica el año pasado para la Cumbre en Johannesburgo del Foro para la Cooperación entre China y Africa (Focac) que compraron cuernos de rinoceronte y “un montón” de marfil. En lugar de pedir que se realice una investigación, Mahlobo expresó su preocupación de que las afirmaciones pudieran dañar las relaciones internacionales entre Sudáfrica y China. “¿Por qué dirías que el Presidente de China trae una delegación a una misión importante en Africa y dirías que han cometido actividades ilegales?” preguntó durante una entrevista. Al momento, no existen indicios que los dichos en torno al tráfico de marfil vayan a ser investigadas. La Iniciativa Global Contra la Delincuencia Trasnacional Organizada trabajó en conjunto con Al Jazeera en aspectos del documental que se centran en los dichos sobre la participación de diplomáticos vietnamitas y norcoreanos en el comercio ilícito de cuernos de rinoceronte. Valiéndose de informes publicados por La iniciativa Global en julio, los autores del documental investigaron el nexo entre la embajada vietnamita en Pretoria y la crianza de animales salvajes en una granja en la provincia de Northern West en Sudáfrica, propiedad de un empresario vietnamita y supuesto jefe de una banda traficante de cuernos. En los últimos meses, varios rinocerontes han muerto en manos de cazadores furtivos en esta granja en circunstancias poco claras. La granja también ha albergado a una cantidad importante de tigres, algunos de los cuales han sido cazados, aparentemente por sus huesos y otras partes de su cuerpo. Por Julian Rademeyer, Investigador Senior de La Iniciativa Global.